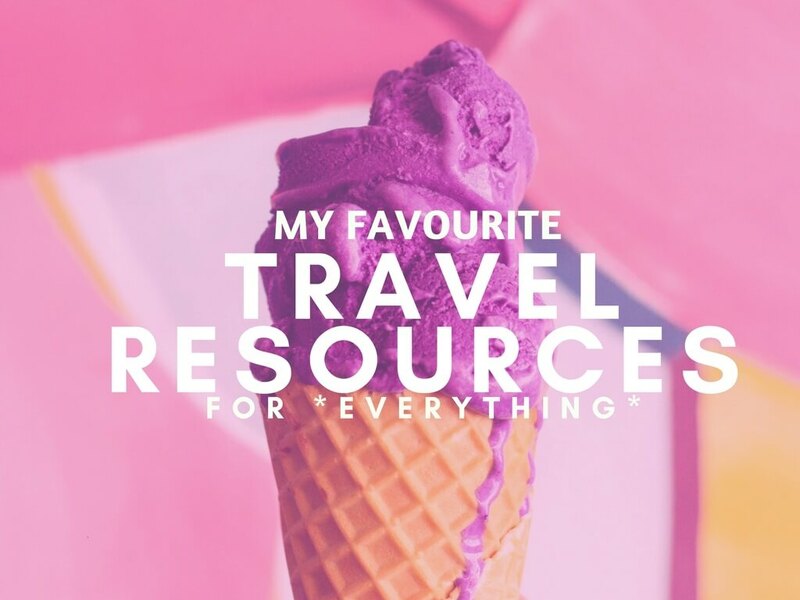 When you travel to Barcelona for the weekend with your parents there are a few extra considerations – maybe they don’t want to go bar hopping, or sunbathing or trekking around one sight after another? My family and I recently had a perfect weekend in Barcelona planned out by my brother, who’s now a resident there. The rents aren’t getting any younger and for various reasons we can’t walk too far, or up steps, so the itinerary had to be carefully planned. We used a few taxis during the weekend – most were around €5, which, when there’s four of you works out cheaper than the metro. It also means you get to see more of the city on top rather than down below, and you get to go from A to B along your route rather than where the trains go. Just stick your hand out and hail one, there are plenty about. Yep, it’s a super tourist area of Barcelona, which means super tourist prices, but it’s also one of the most scenic places to sit and have a calamari, a croquette or other delicious tapas. It’s also a great place for the first day to sit and get your bearings, and to people watch as all the beachgoers will pass right in front of the run of restauarants. We went to Merendero de la Mari for expensive-but-worth-it-tapas. They had a really good system with cards which made it easy to see what you were ordering. Or, if you want some highly recommended by me swordfish you could go to La Gavina, a seafood restaurant just a few up that I explored this week. 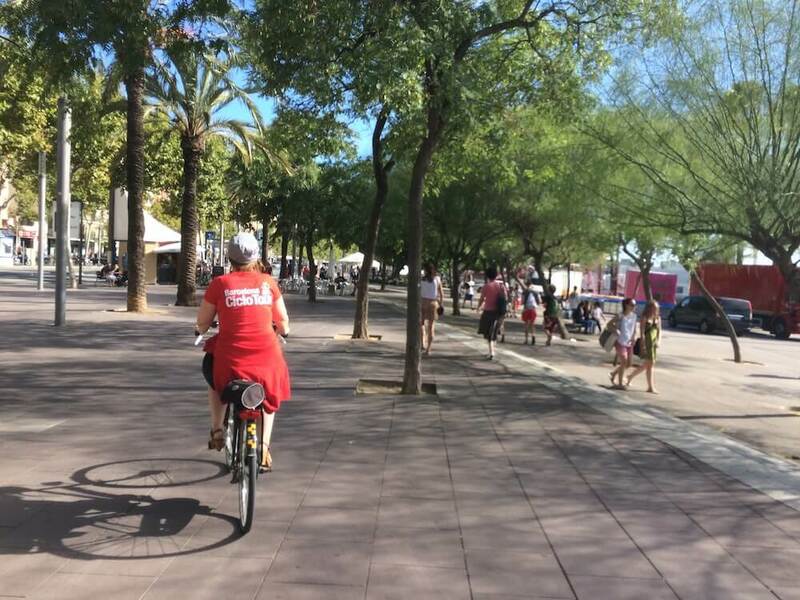 You could spend the afternoon walking up to the beach from there, just a 10-minute walk away, on go on a cycle tour with Barcelona Ciclo Tours or even just chilling out and enjoying where you are. 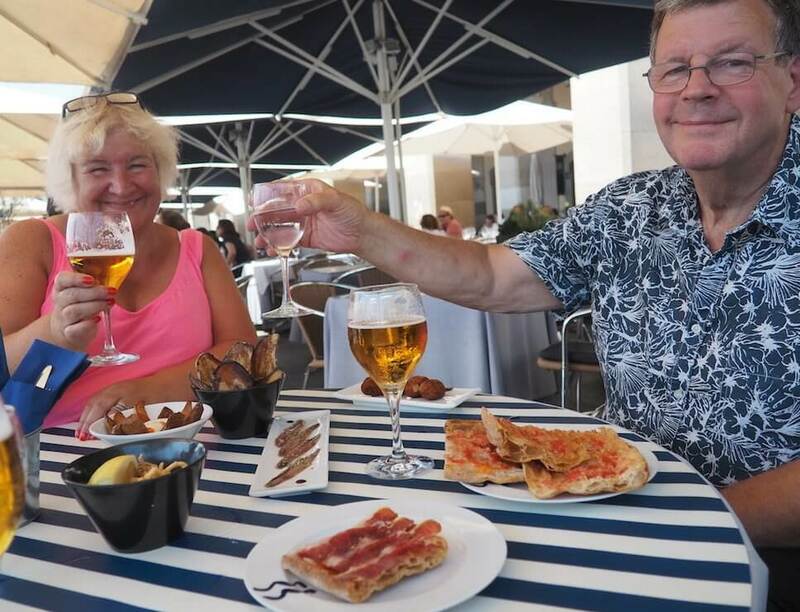 It’d been a long drive for my parents from France and a late night out for my brother and I the night before so we went back to their hotel for a siesta. I pretty much collapsed for an hour on a sun lounger. Entertaining is tiring. Refreshed and ready for action we headed to the El Born area for dinner, with a pre drink. There are so many cool places to eat and drink here I can’t imagine how you’d ever get through them all. In what I predict will be a lot of future visits to Barcelona I’m going to try my hardest to have a good go at them. For dinner we went into the El Born Centre. Here you can grab a table and try all the different foods on offer. It’s kind of like a street food market but indoors, and with a big, huge bar serving super sugary Sangrias. When I saw how much they put in I quickly went off them, but there’s plenty more to choose from. We made our way through Barcelona-style egg and chips, chicken skewers, lamb skewers and a selection of pintxos followed by a selection of cakes. We topped it off with a drink outside in the square and watched a man spinning round in a wheel before he got moved on. This is a really beautiful part of Barcelona I’d definitely advise you to see. We met for coffee in the Barrio Gothic. With so many places to choose from I’d just advise going for one with space outdoors in the shade. Get yourself a café con leche – coffee with milk – and enjoy the view. We were perched outside the Barcelona Cathedral. 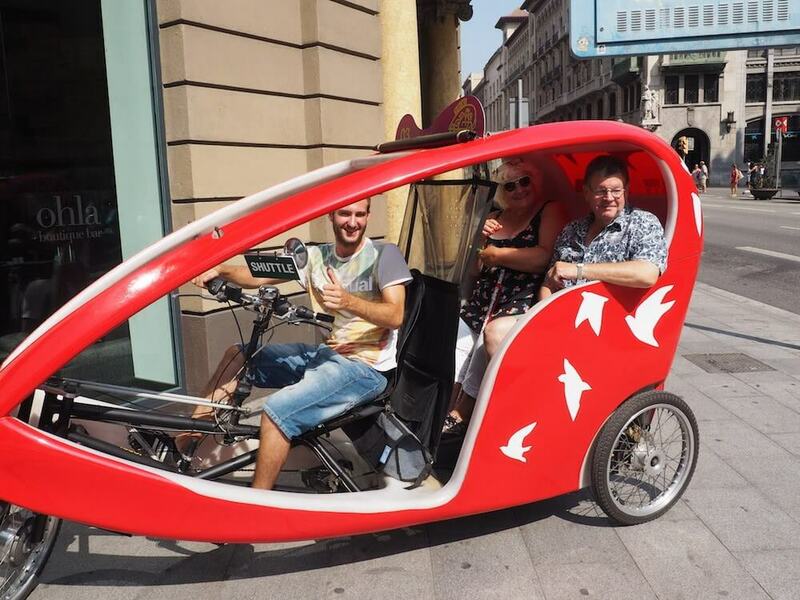 We arranged for mum and dad to have a tour of the Barrio Gothic in a rickshaw. The Barrio Gothic is such an important part of Barcelona it’d be wrong to miss it but it’s also a long and cobbled walk that might not be ideal if you’re not good with wonky walking conditions. We paid €20 for 30 minutes and according to mum and dad he gave a brilliant tour around the best of the area. They were buzzing when they came back to us, if one may describe their parents in that way. After a quick coffee for them we grabbed a taxi up to the Sagrada Familia. We’d booked before for €19.50 so we didn’t have to queue with everyone else, which from the queues turned out to be a brilliant decision. I’d seen the Sagrada Familia before, but never inside so I was happy to go in and explore. You can see inside the Sagrada Familia here. 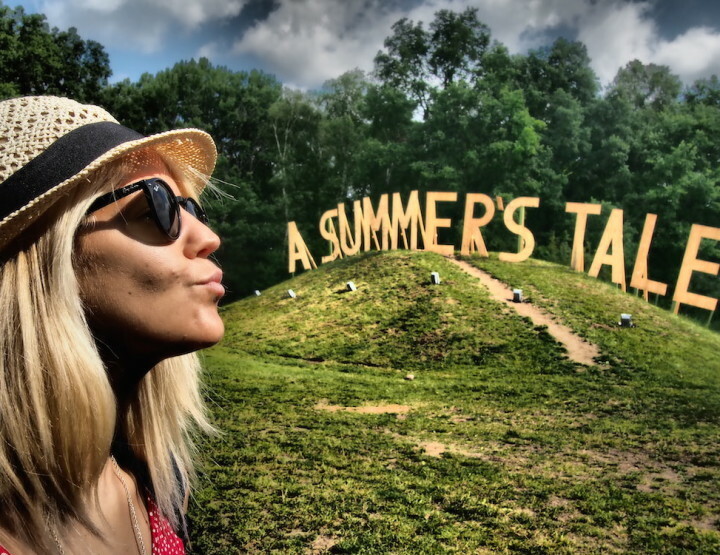 It’s well worth a visit! We spent the afternoon sunning ourselves on top of the City Sightseeing bus along the West Route. This was €27 each and included both routes, although we only wanted to do the West one at two hours as we’d already seen quite a bit on our travels. We saw the Casa Batllo, La Pedrera and the Olympic Centre too. It was a good way to see the city from the comfort of a seat but still out in the fresh air. 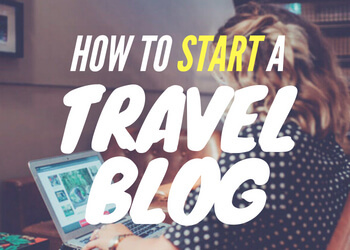 READ MORE: Mark from WyldFamilyTravel.com has written in depth about Barcelona’s Hop on Hop off bus, click through to learn more. We got off at Glories Shopping Centre for a late lunch / early dinner. They were definitely confused at our timings but we’d wanted to see where my brother works, which was somewhere round there. We tried the fish restaurant but they weren’t having it and we had to go for the Meat Corner next door. When it comes to meal times with England vs Spain, we’re never going to agree. The red wine here was some of the best I’ve ever tasted, for real. 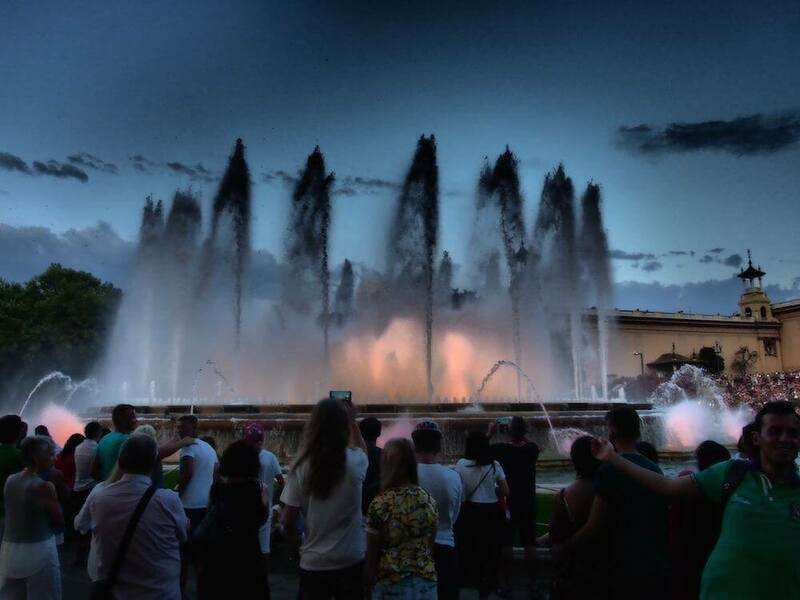 One of the last stops on our Barcelona City Sightseeing Tour was up at the Montjuic Fountains. 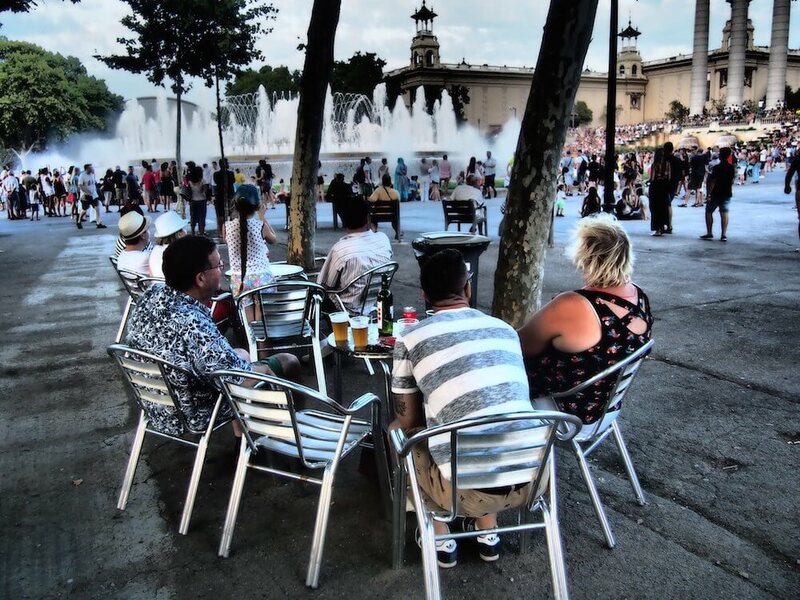 It was 8pm so we decided to get out and see if we could grab a chair to watch the Montjuic Fountain Show. We managed a few beers and wines before the booming sound of Freddie Mercury’s ‘Barcelona’ rang in my ears. Funny because of course we’d been singing this to my brother ever since we found out he was moving to Barcelona. The fountains lit up pinks and purples as the fountains bounced around to the tunes of Katy Perry et al. You definitely need to get here early to get a seat, we got there just in the nick of time to bag a table and chairs. If ever one of us got up to take a photo our fellow fountain friends would be on us like vultures wanting to see if the seat was free. Unfortunately you can’t recreate our third day as we spent the morning hanging out at my bro’s house and then me, mum and dad drove off to France. But, you could do any of the following, all of which I’ve done on other weekend trips to Barcelona and enjoyed. Parc Guell: an awesome park by Gaudi featuring huge sculptures and plenty of wide open space to chill out in. Could be difficult to access if your parents have any mobility issues and will require walking around once you’re in there, but you can enjoy a beautiful and cheap few hours here. 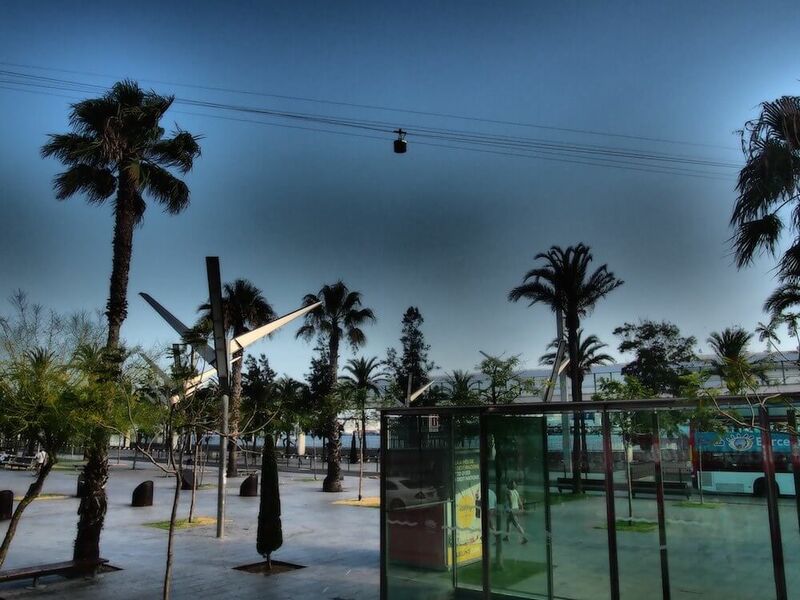 Port Cable Car: take the cable car over the ferry port for incredible views of Barcelona. I did it in 2010! Picasso Museum and tour: I actually still need to do this. Go shopping: so many shops in Barcelona you’d be busy for ever. Take a Sunday to go and find yourself some unique Catalonian treats. Enjoy an EatWith Experience: read my review of the Gaudi experience I tried in Sant Antoni. An 8-course meal inspired by the big man himself, in a super cool hipster apartment too! Or, you could go back to any of the sights you saw along the City Sightseeing tour bus route and go and explore. I’m going back to Casa Batllo this week, inspired by how cool it was when we drove past. 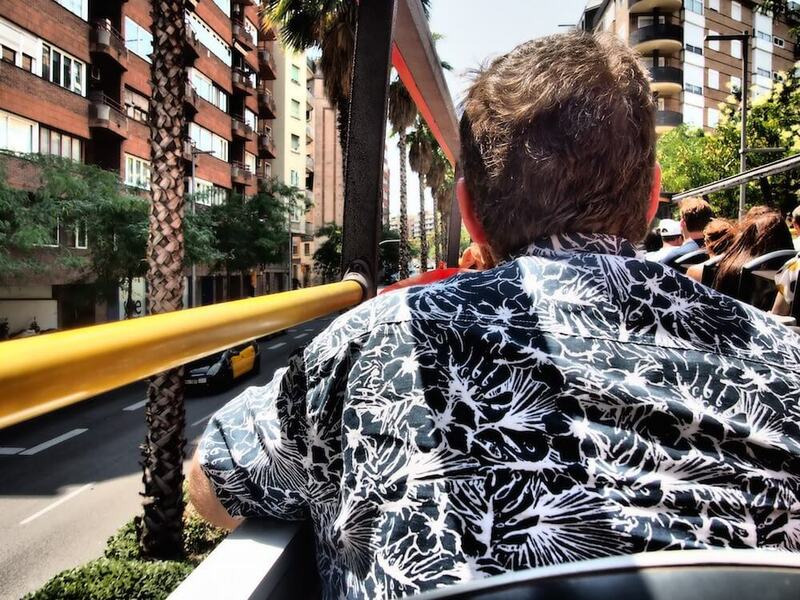 If you’re parents’s mobility is limited, and they have to use a wheelchair, check out this post wheelchair access in Barcelona on Curb Free by Cory Lee. He looks at what to do, where to stay and how to get around Barcelona in a wheelchair. You can fly from the UK to Barcelona with Norwegian Airlines from £29 one way. 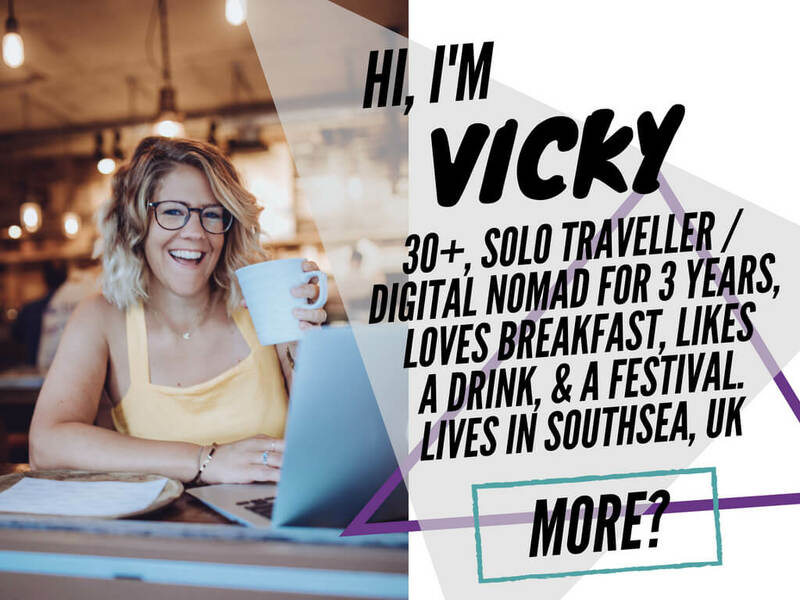 I was invited to experience the service from Barcelona to Gatwick complementary style and can report what felt like extra legroom, great staff, a 20kg luggage allowance and best of all… FREE WI-FI! I will absolutely, definitely be using Norwegian Airlines again, in fact, I’ve already booked a trip with them for December. New favourite short haul? Norwegian offers two flights per day from London Gatwick to Barcelona. Fares start from £29.90 one way. Norwegian offer free Wi-Fi and inflight entertainment on all European routes. What would you do with your parents in Barcelona? And Subscribe to @VickyFlipFlop for the latest vids! Ah that's great news! My parents loved it. Yes, definitely go and see the fountains. They started at 9:30 in the end (we thought it was earlier) and if you want a seat you'll need to get there at 8. If you don't get one you can always sit around on the floor, depending on your dad! 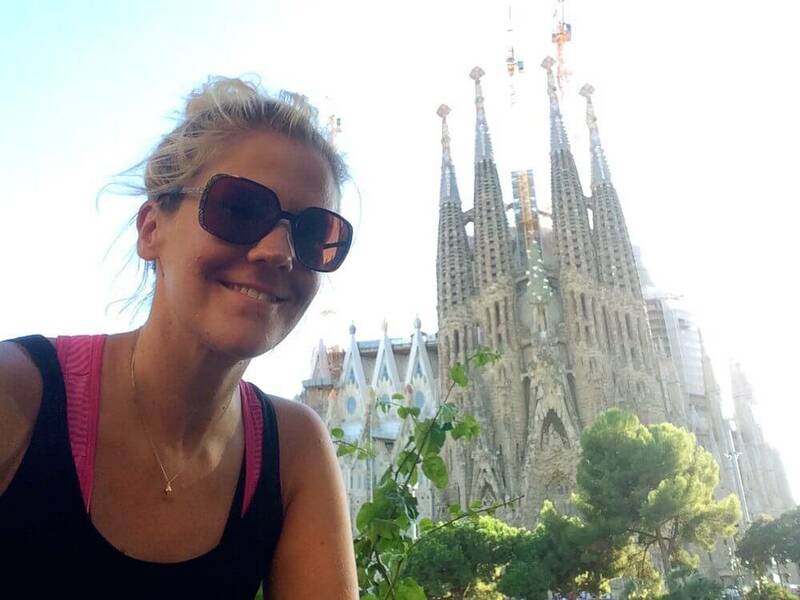 I'm in Barca now and am tempted to go and see the Sagrada Familia again... make sure you book your tickets before :). Have fun! Sounds like an excellent way to spend a couple of days! I went to Barcelona 2 years ago and we went to the Picasso museum... one of the only art museums I actually understood and took in rather than just enjoying the pretty pictures. Ah that's something I haven't managed to do yet in Barcelona. 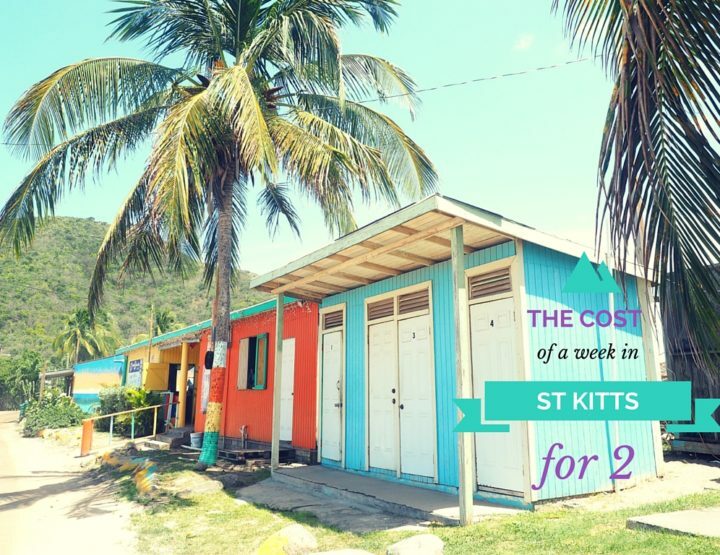 I was going to go last week but time just got away from me! I'd love to do the Picasso tour sometime though. Seeing as my bro lives there now I'll definitely be back. Awww that’s cool. Bit of an adventure! So good to hang out with parents as friends now that we’re all grown up. Love mine!